The launch of Glasnost, Soviet Non Conformist Art form the 1980’s was a glam affair at Haunch of Venison. The juxtaposition between old Russian idealism and theory and new-wave Russian art was particularly apparent in the message and boldness of the vast variety of art on display but also in the appeal to the invited target audience who downed bright red, Stolichnaya ‘Hammer & Sickle cocktails. A mixture of the usual gallery goers mingled with journalists, socialites (not socialists) in Stella McCartney, society movers and shakers, Brit artists and millionaire art curators including Roman Abramovich’s girlfriend and well known patron of the arts, Dasha Zhukova. 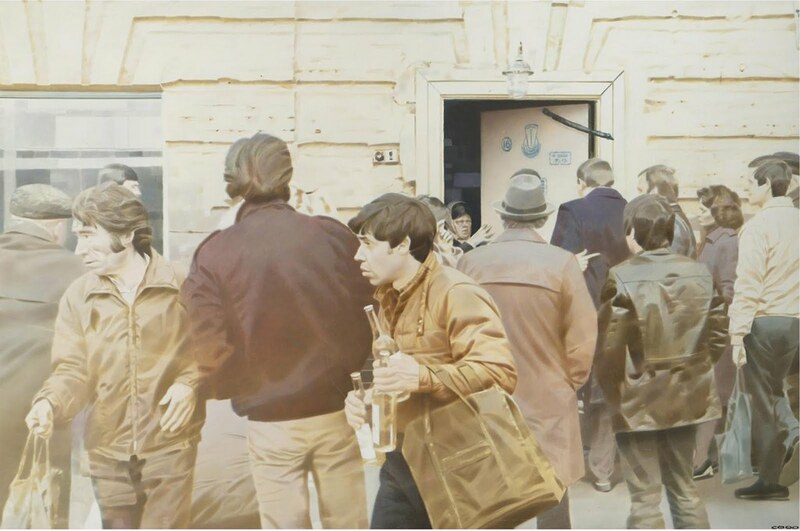 To understand that some of this art was created in a period of subversion during the 60’s and 70’s (by artists such as Erik Bulatov, Oleg Vasilev and Ivan Chuikov) prior to Glasnost partiuclarly highlighted just how far Russian art and politics have changed. Gorbachev’s emphasis on transparency and freedom of speech encouraged these very Non Conformist artists who had previously worked underground outside the system to develop strategies and artwork that was independent and often opencly critical of the institutiosn of Soviet culture. On first entering the gallery I caught site of a piece that reminded me of Tooting Bec’s Citizen Smith rather than cuddly Citizen Gorbachev or Yeltsin’s Perestroiska. My heart sank to a Siberian like chill. However, it wasn’t long before I found the remaining 130 works of disparate art that either appealed or appalled, though thankfully the latter was kept to a minimum. Paricularly striking was the pop art style of the Sots Arts – a contradiction and combination of deconstructed motifs of Socialist art and the advertising aesthetic of Western Pop Art. Ivan Chuicov plays with Gorbachev’s recognisable image while Alexander Brodsky’s untitled work of 72 teabags, each has a pigeon profile which morphs into people. Erik Bulatov’s New York (1989) combines the skyscraper appeal of New York and endless possibilities with stark Soviet style graphics and sloganeering while Edouard Gorokhovsky’s strong composite portrait os Stalin (1990) reveals his preoccupation with optics, explored through reproduction – an image made up of multiple smaller images – very clever. Hyperrealism is highlighted and reminiscent of the New Glasgow Boys’, Steven Campbell and Peter Howson’s work. Glasgow or Glasnost – they are remarkably similar highlighting the gloom tinged reality of peoples’. Semyon Faibisovich’s ‘In the Line of Vodka’ captures people in the margins of society while Sergey Borisov’s Catwalk is a black and white homage to Russian fashion. The new avant gardists’ work featured such works as a Russian red tablecloth with hammer and sickles used as place settings with pristine white dinner plates – a coy comment on dinner party communism. New artists of Leningrad (due to a scarcity of means) experimented with unconventional materials. Bed sheets were used instead of canvases and existing objects appropriated and altered in the place of new creations. ‘Nicht Schlafen’ (1987) by Nikolay Kozlov echoed the German invasion of Russia on a pristine white cotton and lace bed with tanks rolling across the sheets. In all, the exhibition contains arresting works that take on the pertinence of history and politics. Who knows what Putin’s legacy to art will be.